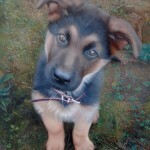 Have you ever considered commissioning a dog portrait in uniform? Take a look at Deef the dog above. 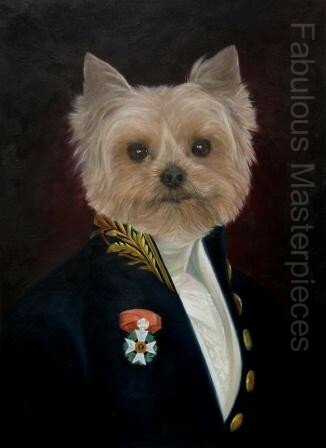 His owners really wanted an oil painting of their dog painted as the Count of Monte Cristo. And personally, I think it’s come out really well. In fact our paintings of dogs in uniform or having your dogs in costume have become extremely popular, more so than our dog artists ever thought. Why is having your dog painted in uniform so in demand these days? I think we can all remember those world-famous dogs in costumes playing poker that were painted by Coolidge. One of those paintings even appeared in the film ‘The Thomas Crown Affair’. Since then the idea of dogs as humans or dogs in uniform or costume have evolved. Thierry Poncelet then took over and he has became famous for painting dogs in suits, military uniforms, Victorian dress and the whole movement has really taken off from there. Why? 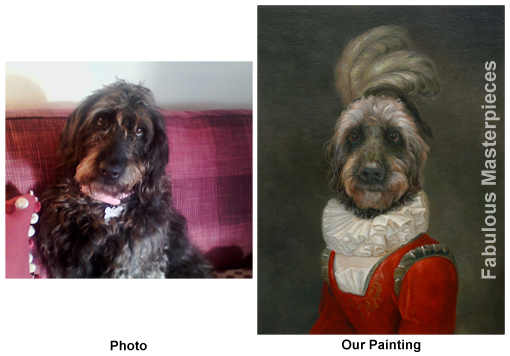 Well, the idea of being able to commission an oil painting of your dog in human dress to express his or her personality is a wonderful idea. For example, if your dog barks and is fiercely protective having him/her painted in a military uniform would be very suitable. 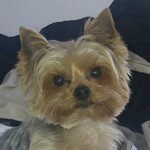 Likewise if your dog is gentle having her painted in period lacy dress might suit her personality down to the ground. The best thing about having paintings of your dogs in uniform or costume is that it’s very unique and completely in your control as to what you want your dogs to be painted in. 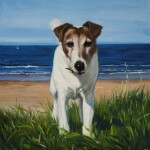 Another option, If you prefer is that you can always have your dog painted into your favourite oil painting. 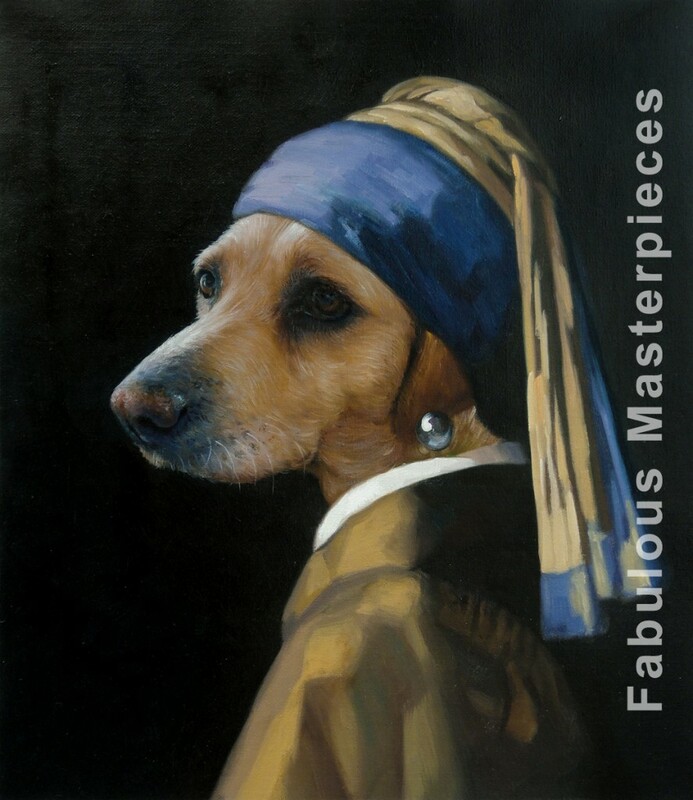 Take Millie the Labrador, her owner wanted her painted as Vermeer’s Girl with a Pearl Earring. It’s so simple. 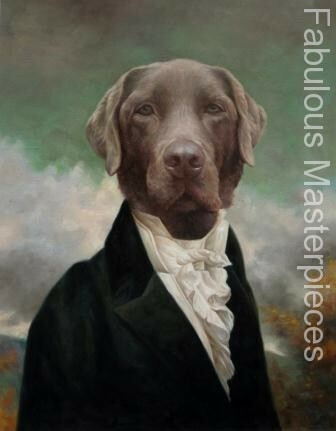 Simply email: info@fabulousmasterpieces.co.uk a photo of your dog and tell us what costume or uniform you would like your dog to be painted in. 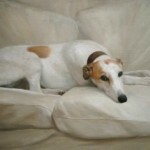 Give us 3 – 4 weeks to paint your oil portrait (we use Winsor & Newton oils as they’re the best) and voila that’s it! We’ll send you a high resolution photo of your oil painting to see if you would like us to make any amendments to it and once finalized, we will post you your beautiful dog portrait to you! 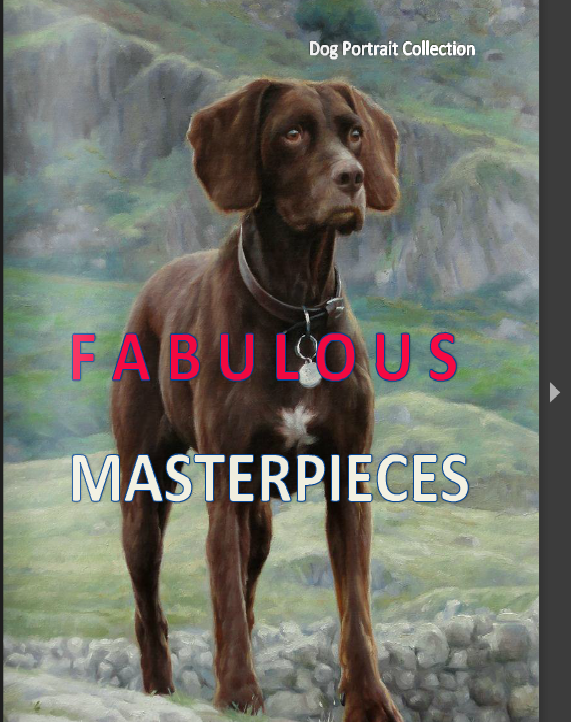 Fabulous Masterpieces has now put together a dog portfolio for people wanting to commission dog portraits by top dog artists. We’ve also put the photo of the dog that was given to the artist next to the resulting hand-painted dog portrait, allowing you to see the quality and scope of work that our dog artists can actually do. We’d love to hear from you! If you would like to add something, or ask a question concerning our dog portraits please leave a comment below or email us. And yes we do deliver world-wide! 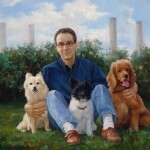 These paintings look wonderful and I am curious as to what it would cost to have one created of my dog. Thanks!